Once the mask has been removed from the packaging and all components are fit together, use your thumbs and index fingers to pull the wings of the cushion slightly apart from one another. With the mask opened widely, insert the pillows inside the nostrils and position until a secure fit is obtained. Allow the cushion material to enclose the nose to complete the seal around the nose. Using one hand, hold the frame and cushion closely to the face and pull the headgear over the head so both headgear straps land softly at the back of the head. 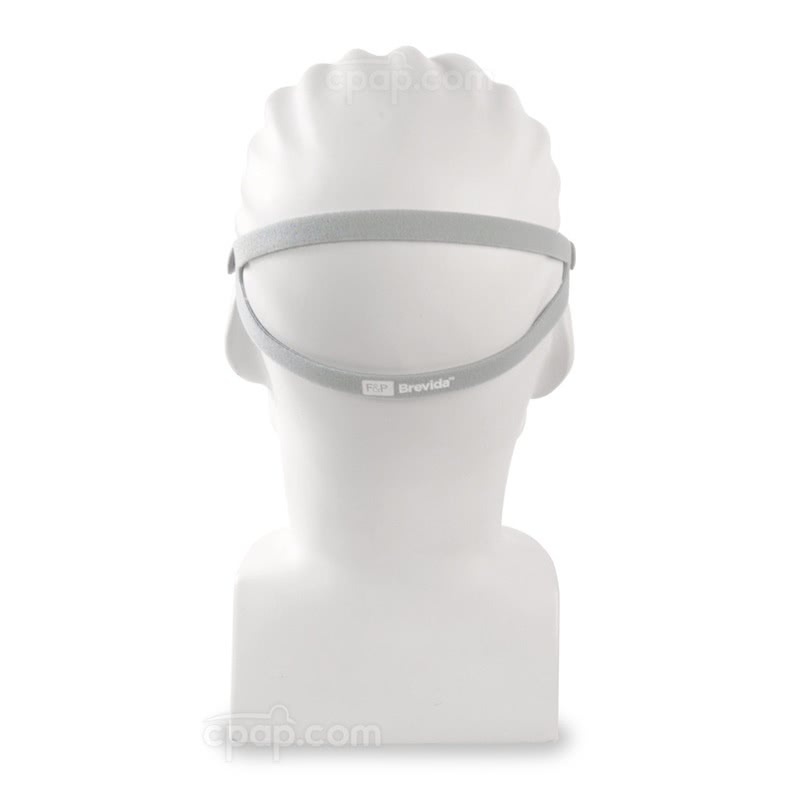 Fit the headgear along the face ensuring the material is above the ears and below the eyes. Lift the hook and loop tabs on the other side of the headgear clips and begin pulling the straps through the clips to increase or decrease tension. Once the best fit is obtained, secure the hook and loop tabs to the headgear. 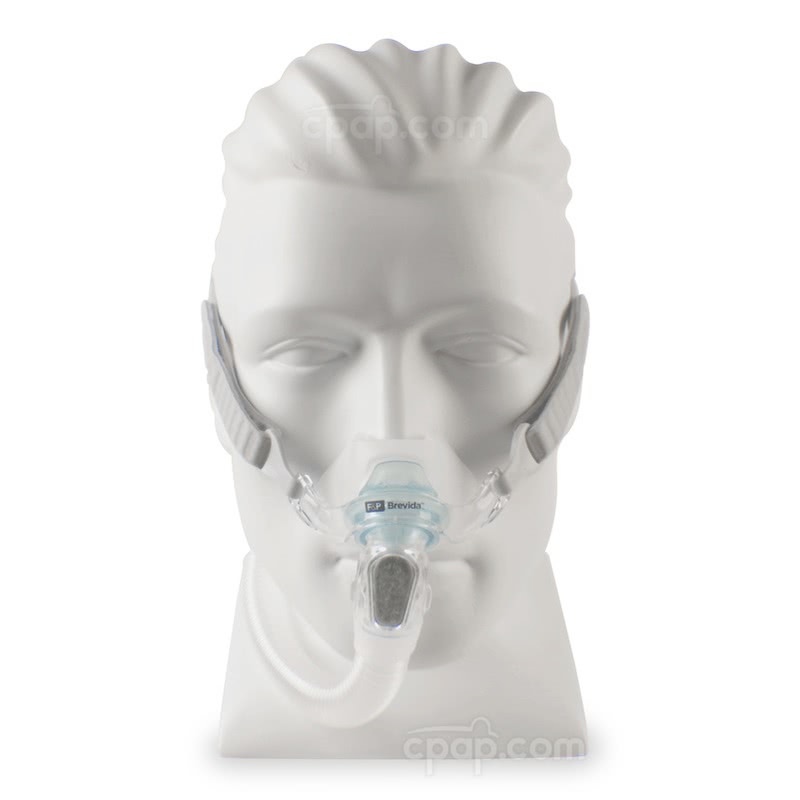 Gently push the nasal pillow cushion into the opening in the middle of the mask frame. Thread the headgear straps through the headgear clips and close the the hook and loop tab to the headgear for closure. Attach the headgear clips to the mask frame. Snap the diffuser cap onto the top of the mask elbow. 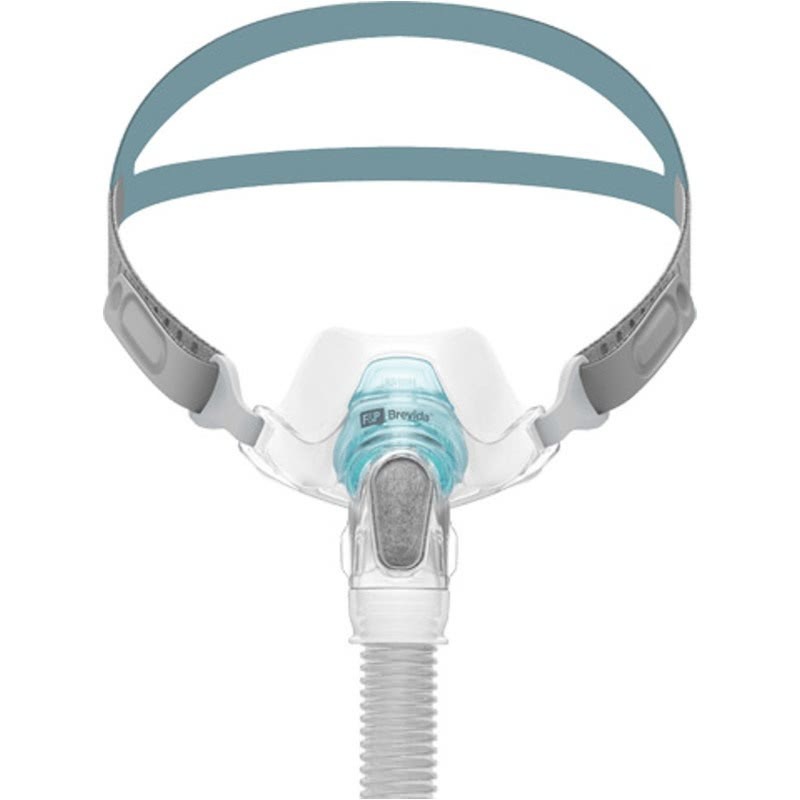 Connect the blue rim of the swivel to the short tube, then connect the short tube to the mask elbow. 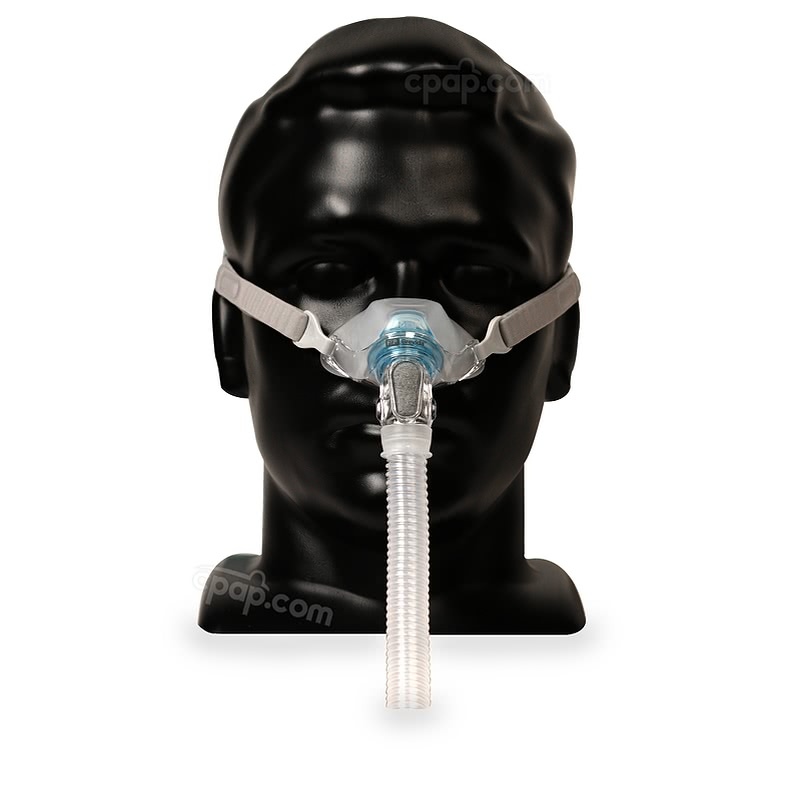 Pair one end of the CPAP hose to the swivel and the other end to the CPAP machine. The mask may be taken apart for a few reasons. Follow these guidelines for removing parts from the Brevida™ mask. If replacing a singular part, remove the piece being replaced and add the new part in its place. If dismantling for cleaning, remove the headgear clips from the headgear. Then, remove the nasal pillow cushion from the mask frame. Remove the diffuser cap and the short tube from the elbow before finally removing the swivel from the short tube. 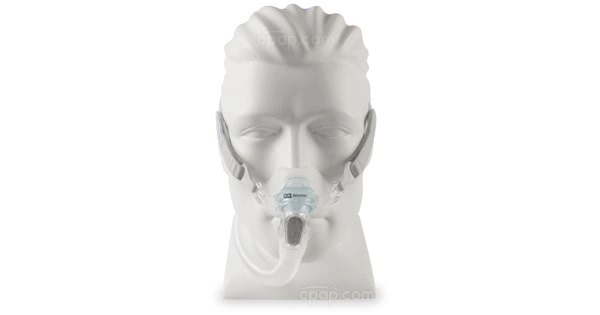 To increase the effectiveness of therapy, check the mask components for wear and tear before each use. If the cushion or tube become torn, seek replacements before using the device. Air must always be able to flow inside and outside of the mask. Ensure the diffuser is free from blockage and maintain a daily cleaning schedule to ensure all other components remain in good working order. Cushion, Short Tube, and Swivel: Wash daily in warm water with mild soap. Do not exceed 10 minutes. Rinse with fresh water until all soap residue is gone and allow the components to air dry away from direct sunlight before wearing. Headgear and Diffuser Cap: Wash at least once per week in warm water with mild soap. Do not exceed 10 minutes. Rinse with fresh water until all soap residue is gone and allow the components to air dry away from direct sunlight before wearing.